My name isn’t real. Everything I know about my family was told to keep me from looking for them. All this time, I’ve assumed my father was dead. Imagine my surprise when I find out not only is he alive, but I have two siblings I never knew existed. Oh, and the biggest lie of all? That I’m safe. Only one man has the guts to tell me the truth. Casper North is everything I’m not. Brave. Wild. Adventurous-with a reputation for living on the edge. My story unravels around the same time I discover he’s stalking me. Or as he calls it, protecting me. He invades my personal space, refusing to leave. Just being near me puts his life at risk, but he stays anyway, ripping away the illusions and exposing me for who I really am. My real name is Amelia Serra. My family’s legacy is death. One by one, we fall like dominoes, until eventually, there will be none of us left. Guess who’s next in line? That’s right-yours truly. She’s naïve. Gorgeous. And a Serra. Meaning, she will die. Soon. I was never even supposed to meet her. She was just a side job, some extra cash in my pocket, and a favor to her father. Watch her, find out if someone’s after her-that’s all I was told to do. Then she had to go and put herself on the brink of death, forever linking my life with hers. Now I can’t stay away. I should get out of her life. Stay unattached. Except I can’t. There’s something about her that draws me in, and I refuse to let go. The last time I lost someone, it almost destroyed me. Amelia just might be the girl who buries me for good. There’s a target on her back, but she’s marking an X across my heart. 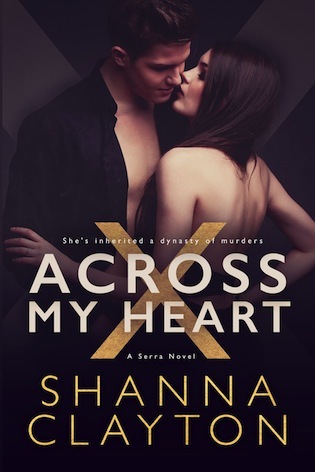 Across My Heart is a FULL-LENGTH, standalone novel at 95,000+ words. I live and breathe all things books. When I’m not writing, I can be found eating too much chocolate, obsessing over Game of Thrones, and spending time with my crazy family. Keep up with me on social media. I LOVE hearing from readers!